Are you looking to improve your outdoor space this summer? Are you less than satisfied with the look and condition of your patio at the moment? Then you’ve come to the right place today because this article will draw your attention towards some of the best patio ideas on a budget you’ll find online. Feel free to use any of these suggestions or add the concepts to an existing plan for renovation. Regardless of the size and shape or your space or what you want to achieve, the tips published on this page should help to ensure you leave no stone unturned and get the best possible results from your efforts. There is nothing in the rulebook that says your patio has to remain on one level. For that reason, you might think about using a split-level patio and adding a couple of steps in a suitable place. That will add an extra dimension to your design and open up many new options. You can choose from a range of different materials when creating the patio of your dreams. Bricks are cheap to purchase, and you can pay them in various ways to form new and exciting patterns. You just need to sit down with a pencil and some paper to come up with your design. Perhaps you like the idea of creating some mosaics and adding them to your new patio design? The process is simple, and you will find lots of guides online that help you to come up with intricate patterns using only a few different coloured bricks and similar items. If you want your patio to stand the test of time and look fantastic for many years, then you might consider the use of natural stone. It tends to create a more upmarket aesthetic, and you can cut the stone relatively easily into any shapes or sizes you desire. Poured concrete is perhaps the cheapest patio solution, and some people think it looks boring. However, those folks have no imagination. You should see the concrete as a blank canvas where you could get creative. Nothing is stopping you from painting the surface in any weird or wonderful way that appeals to you. There are no limits to what you can achieve when it comes to the shape of your patio space. 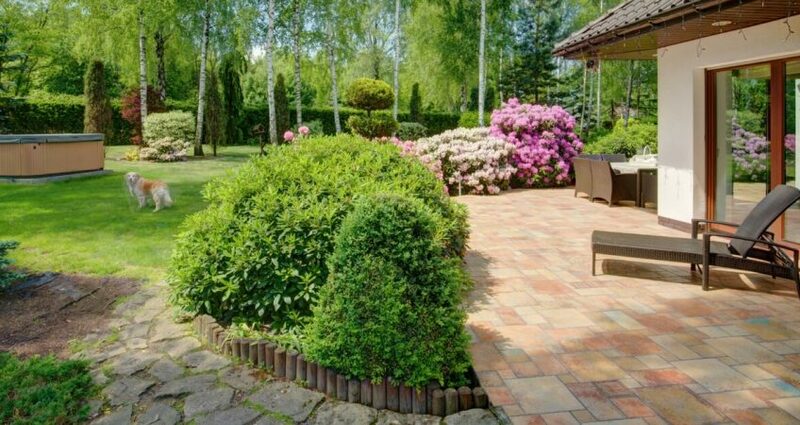 You don’t have to make the area rectangular if you think a circular structure will look more attractive and still serve its function. Lots of homeowners enjoy hosting garden parties during the summer months, and that usually involves someone cooking outside. Instead of buying gas bottles and expensive equipment, you could build a permanent brick BBQ on your patio. Maybe you like the idea of using wood to create some form of shelter for your patio area? Well, you just need to take a look at some of the most popular gazebo designs and create something in the same vein. That is not going to break the bank, but it will mean you can use the patio, even when it’s raining. Regardless of what you want to achieve, there is nothing wrong with taking multiple ideas from this page and mixing them. Sometimes people manage to create something unusual by not following the herd and trying something new. There are many ways in which you could add a splash of colour to your patio space. Maybe you like the idea of painting some of the concrete, stone, or bricks you use to build the structure? You could even leave room for some flower beds and brighten the area up using plants from your local garden centre. There are no limits to what you can achieve if you set your mind to it. Those ten patio ideas should help to ensure you leave no stone unturned this spring and summer as you navigate those essential outdoor jobs. None of the suggestions made in this article is going to cost a fortune or require a substantial time commitment. You could even involve the entire family in the decision making process if you want to ensure you get the best possible outcomes. Anything is possible, and we hope that you end up with the patio of your dreams during the next couple of months, whatever that might involve.